Each spring, thousands of pilgrims from all over the world flock to Jerusalem to get a taste, a moment where they feel closer to the Divine. Sitting by the Sea of Galilee, walking through the dusty streets of Jerusalem, or being present anywhere that Jesus was reported to be is surreal. But what does it mean to celebrate Easter in the Holy Land under a military occupation? I was living in Jericho during Easter in 2018. In the months leading up, I was curious, anxious, anticipating what it would be like to spend this season in the place I had read about since childhood. What would it be like to walk the Via Dolorosa on Good Friday? How would it feel to be on the Mount of Olives at sunrise on Easter Sunday? The answer is, I really don’t know. I spent Easter with 300 sheep. From January to April, 2018, I was living in the West Bank with the Ecumenical Accompaniment Program in Palestine and Israel (EAPPI) , a program of the World Council of Churches and supported by The Presbyterian Church in Canada. Our mission as Ecumenical Accompaniers was to witness life under Israeli military occupation, to engage with and support Palestinians and Israelis pursuing a just peace, and work to change the international community’s involvement, urging them to adhere to international law and work for justice in the region. We used the model of accompaniment as the framework for the work that we did. This model is guided by International Humanitarian Law and requires both a strategic local presence and international pressure in order to be effective. 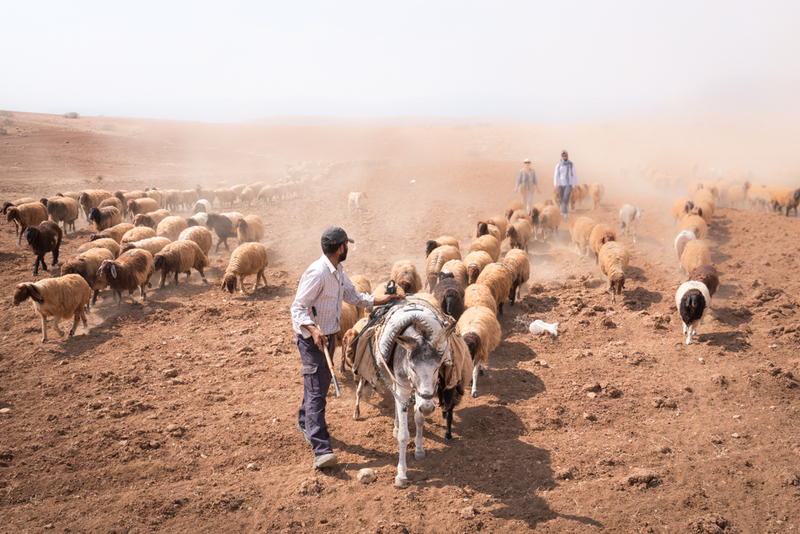 As part of the team living in Jericho, we regularly spent time with Palestinian shepherds throughout the Jordan Valley who frequently faced violence and harassment from the Israeli military and Israeli settlers. We were often reporting on shepherds being illegally denied from accessing their land, families being harassed in their homes and Palestinians that had been beaten or threatened by Israeli settlers. On Easter Sunday, our team had planned to attend worship, to be in communion with Indigenous Christians and connect to the roots of our faith. However, in the Occupied Palestinian Territories, things change in an instant. We were called to a community in the north of the Jordan Valley that regularly experienced the short end of unjust policies. This community has been living in the area for generations, but the creation of an illegal settlement outpost has made life very difficult. It was not uncommon for the Israeli military to tell the Palestinian shepherds they were not allowed to take their sheep to graze on land that was legally theirs. The soldiers would cite various reasons: the area is a closed military zone, it’s a nature reserve, it’s a firing zone—or all of the above. The Palestinians were routinely driven off their land, resulting in suffering economically by not being able to feed their sheep, while the same land zoning was never applied to Israeli settlers who, in violation of International Law, had illegally moved into the West Bank. I was reminded of an important aspect of Easter that day: Easter is about the triumph of the powers of light and life over death and destruction. If we think back to the first century in which the gospels were written, we know the people of the land were occupied by the Roman Empire. The forms of oppression may have changed, there were no machine guns, tanks or tear gas in biblical times, but there were people seen as less than human. Jesus was crucified because he refused the dominant system of power that produced injustice. I believe Jesus is inviting us into the creation of the world that God wants for us, a world where we will relentlessly pursue justice and be creators of peace. On one of my first days in the region, a preacher said, “The Holy Land is the best place to lose your faith.” During my visit, the preacher’s words kept coming back to me. I would walk throughout the Holy Land, literally where Jesus walked, and see so much pain and suffering. I felt angry, sad and hopeless. But I also had moments of joy and moments where I have never felt closer to God. But these moments did not happen in biblical ruins, they did not happen in the dead stones. I felt it among the living stones, the people of the land. We are in an impossible moment. The global church is called into “costly solidarity” with the local church, to boldly accompany those facing injustice. A ministry of presence cannot be passive, it must speak out in the face of oppression. Accompaniment is daring, speaking truth to power. We are called into God’s mission—a mission of justice, a mission of peace, a mission of hope, a mission of love. Click here to learn more about the daily reality of living under occupation and the work of EAPPI in the Jordan Valley. EAPPI was created in 2002 by the World Council of Churches based on a letter and an appeal from local church leaders in Jerusalem to create an international presence in the region. Seventeen years later, there is a continuous presence of 25–30 volunteers on the ground to provide protective presence and witness life under occupation. Upon returning home, Ecumenical Accompaniers share their first-hand experience within their church and civil society networks to advocate for a just peace in Palestine and Israel, based on international law. Settlements are Jewish-Israeli cities, towns and villages that have been established in the occupied Palestinian Territories (and the Golan heights). According to the Fourth Geneva Convention, settlements are in violation of international law. Settlement outposts are settlements that have, in theory, been established by individuals without the authorization of the Israeli government but benefit from services that Palestinians are denied and backing from the Israeli military. Those living in settlements are Jewish-Israeli citizens, called settlers. Part of this reflection was originally published in the Fall 2018 issue of the Presbyterian Connection newspaper.